We employ a unique Consultative Client Management process, we call PlanIt 360 . This process utilizes proven research with documented deliverables along every step. Our process designs a plan specific to your individual needs, not a cookie-cutter, one-size-fits-all approach, but a 360 degree plan of your life, your goals and objectives. This meeting is to explore that we are the right firm for you. We work with a limited number of successful families. This process ensures that we only work with clients for whom we can offer extraordinary value. At the end of this meeting, we will both know if we can add substantial value to your situation. We will obtain a commitment to move forward. 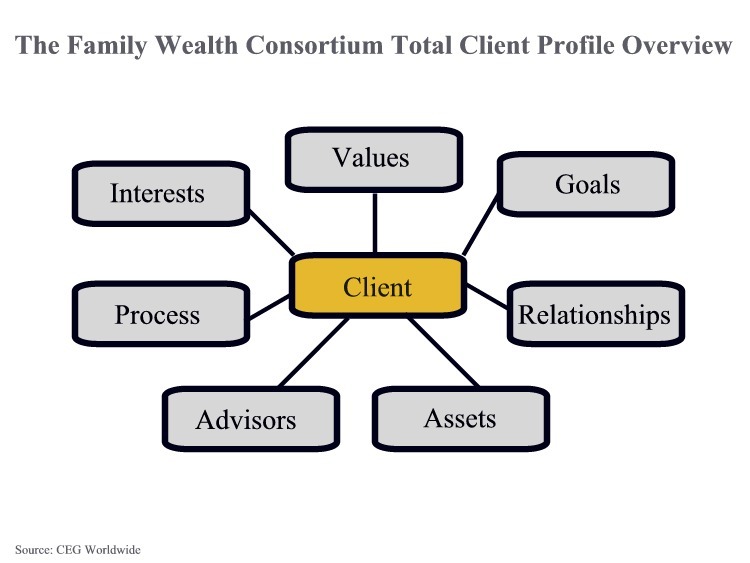 At the heart of our discovery meeting, we will prepare our Family Wealth Consortium Total Client Profile. Our objective in this exercise is to listen -- deeply listen to you and to evaluate from ourside and yourside that their is a "good fit" in a mutual relationship to provide substantial value to your circumstances. If there is a good match, we will use the information obtained as a starting point for brainstorming sessions with your network of professional advisors to move to the next steps: investment plan and wealth management plan. We will meet again in about two weeks to review a detailed, actionable Investment Plan, including an Investment Policy Statement. Make a mutual commitment to work together to achieve your goals and values. We will execute documents and paperwork to implement the investment plan. Review any questions that have arisen since our last meeting. Review and discuss any changes in circumstances that will affect the Wealth Management Plan. Schedule the next Regular Progress Meeting and review steps for the Advanced Wealth Management Plan. Review progress toward meeting goals. Answer questions since previous meetings. Review changes in circumstances that will affect plans. Present and execute a Comprehensive Advanced Wealth Management Plan. Range of recommendations to address specific financial challenges. Recommendations are prioritized according to impact on your life.